As fall arrives and life gets busy, weeknight dinners can be a challenge. Pasta can be a savior on a hectic weeknight when you’re working late, racing to a soccer game and trying to power through a math assignment with your numerically disinclined offspring. I know pasta has been maligned as the demon carb and shoved aside in favor of high-protein meals by proponents of the Atkins, South Beach and paleo diets, but I’m not suggesting that it be consumed by the bucketful five nights a week. Everything in moderation. These three quick and delicious meals will become your go-to dishes on busy — or not-so-busy — nights. This dish was inspired by a meal I had in Rome last spring. It was a simple, delicious way to showcase spectacular ingredients: ripe tomatoes, creamy burrata cheese and fresh basil. The burrata, which is basically fresh mozzarella with a luscious creamy center, can be a bit hard to find. If it is not available, simply use fresh mozzarella cut into small pieces. It won’t bring the same creamy texture to the sauce, but it’s still pretty darn good. And either way, dinner will be ready in 15 minutes. Rinse and drain the cherry tomatoes. In a large skillet, heat the oil, salt, pepper and garlic, and add the tomatoes. Stir and cook over medium to medium-high heat for about 10 minutes. You want the tomatoes to scorch a little bit, pan roast and pop. While the tomatoes cook, boil a large pot of salted water and cook pasta to al dente (usually 1-2 minutes less than the package recommends). Reserve a cup of the cooking water before draining. Sprinkle with basil leaves and serve. This is a great way to get kids to eat greens. I used spicy Italian turkey sausage, but any type that your family likes is fine. Buying bulk sausage out of the casings saves time. I used red chard for this, but any leafy green would work well. In a large skillet, heat the olive oil and brown the sausage with the salt and pepper. Continue this process until sausage is completely cooked, about 8 minutes. Add the greens to the skillet and cover, allowing them to steam until cooked. Time will vary depending on the greens; spinach and chard cook quickly, in about 3 minutes, while kale and collards take longer, about 8-10 minutes. Turn the greens over a few times during the cooking process to ensure they steam evenly. When the greens are totally wilted, stir to blend them with the sausage. While the sauce cooks, bring a large pot of salted water to a boil and cook the pasta according to directions for al dente (usually 1-2 minutes less than package recommends). Reserve a cup of the pasta water, then drain the pasta. Pour the pasta into the skillet with the sausage/greens mixture and toss well. If the mixture seems dry, add a bit of pasta water to loosen the sauce. This is a wonderful side, but in a pinch it can be a main course. It’s great with an Asian or teriyaki-style marinated fish, chicken, meat or tofu, or as a bed for a stir fry. This is the most basic version, but you can add whatever you want to the sauce and toss it all together for a quick, simple dinner. The recipe below follows the instructions for the rice noodles I bought at a local Asian market; they were semi-translucent white, very thin and came in a brick about the size of a yoga block. Be sure to follow the instructions on your package as they may differ. 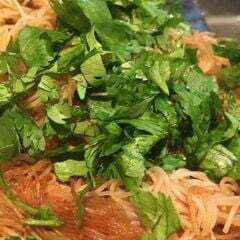 Place the rice noodles in a large bowl or pot with a cover. Bring two quarts of water to a boil. When the water boils, pour it over the rice noodles to completely submerge, and cover. Stir once or twice and drain completely after 2 minutes; run cold water over the noodles to stop the cooking. In a large skillet, heat the oil, ginger, garlic and pepper flakes until fragrant. Add soy, vinegar and sesame oil and stir. At this point, add any veggies, meat, tofu, beans, etc., as desired. Add the noodles to the skillet and stir to coat. Cook in the skillet to allow some of the noodles to crisp a bit. (The varied texture makes the dish more interesting.) Sprinkle chopped cilantro over the dish and serve it hot, warm or cold. This article originally appeared in the Jewish Exponent, a Jewish News-affiliated publication.